Pilgrimage. A difficult word. Better just to say I’m taking a trip. I would avoid the word now, were it not the one which enters my thoughts so readily as I approach this island. Likely, the word has often harbored mixed associations; filled as easily with pride and puffery as with aspiration and renunciation. Ambiguous and false pilgrimages have floated on the breezes of time as easily as spring pollen. Their pathways have been lined with long-windedness and liquor, the bawdy and the tawdry amidst the sweeter strivings for the light. I would reject such imagery outright and just take my trip. Yet the word persists. No pilgrim, I consider pilgrimage. I suspect I am not the first to approach Yakushima with similar thoughts; now that this island has been officially heralded for its ancient trees, designated by the U.N. as a World Heritage site, and celebrated in magazines and television as a Mecca of the natural world. Now that the idea of traveling to venerate its trees and wilds has received the blessing of public esteem. The announcements of the sacred have arrived. My reasons for visiting, however, are private. But, inevitably, my journey brings with it the mental baggage of the places from which I come. And likely, this is part of what pushes the trip into taking on an air of pilgrimage. Much as I would prefer to keep it simple, it becomes complicated. The private becomes public. The public, private. No doubt, if I didn’t feel this need to get away from the city now it would be easier to travel here more simply. To just slip away. As if on a business trip. As if on vacation. But my mind is hardly vacant. It carries the city with me. I realize I need to get away. To simplify, perhaps to change. The need tugs at me and shapes the topography of my trip. Already I taste joy in the expectations. An hour in the airport between planes. Time to kill—strange words. So easy to say, and sometimes to do. Ten am. Usually a cup of coffee and a book or a newspaper do the trick. But today, I just sit facing the window, the tarmac and the refueling planes, thinking of the island, where I am going. I feel the city rhythms, its adrenaline, working away in my veins. A thirty-minute flight from Kagoshima. The smoldering volcanic breath of Sakurajima passes below the wings of the small propeller plane. The sky gradually darkens and clouds. As we approach Yakushima, its peaks are shrouded. Just glimpses and hints of the coastal range. The little airport. I descend from the plane and walk across the concrete. Breathe sweet, fresh, damp tropical air. I spot a small hawk perched on a signpost. It stretches, flutters, and flies. A good sign? The weather is changing. Strong hints of rain. I look about and consider my plans. I have made no arrangements. Where to stay? Where to go? In the airport terminal I ask questions. “It’s dangerous to go into the mountain now. You’d better wait. You probably won’t be able to get in there this trip. Better be prepared to come back several times until the weather is right… This is an island of rain and storm and the mountains are harsh. There’s probably a blizzard up there now… Just last season a woman camping with a group got up in the night to go to the toilet and never returned.” (I will hear this same story repeated by several different groups as I wait in the town through the next days for the weather to break). How much of this talk is just lore? How much is wisdom? “Will the mountain open for me?” I find myself asking. Inevitably, already, the language of the supplicant, of the pilgrim, has come slipping in. Will the rains abate, the winds subside, the snows hold off? Will the heavens open, and permit? Am I really ready? I know this business of waiting for the mountain to open for me is largely my private conceit. The mountain is always open, and the heavens are mute as to whether I may enter. And with well-marked trails, Gore-tex gear and high-tech camping equipment, I suspect it is hardly a matter of danger that stands in my way. Yet nonetheless, there remains just as much this question of whether it is right, of whether I am ready. Beyond the lower mountain slopes I see only clouds and sheets of gale-blown wind. In the airport parking lot I strike up a conversation with a fellow I have noticed since Tokyo; taking the same monorail, and the two successive flights. I ask him where he will stay, what he will see. Name cards, de rigeur, are exchanged. Koizumi-san invites me to stay at the same lodge. It sounds a bit luxurious, but he can get me the same discount as he has arranged, through some deal. The feeling is right. Some good food, drink and talk on a rainy night sounds good. We rent a car and explore around the island, checking out road-accessible waterfalls and other scenic tourist spots. Yakushima is about 85 miles in circumference—a large little island. Volcanic, and almost perfectly circular, it is not composed of one sweeping Fuji-shaped cone. Rather, it contains a series of rugged mountain ranges. A miniature continent. So rugged are these mountains, they have impeded development and at least partly dampened the extent of logging. 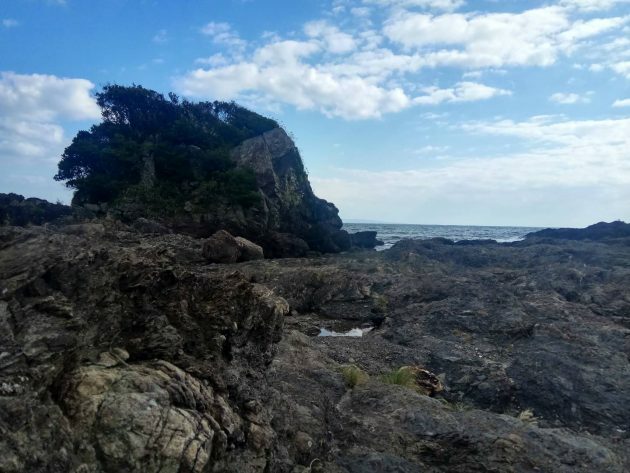 The island is known for its treasures of multi-thousand year-old cedars, the yaku sugi, and also for its extreme diversity of climate and wildlife, harbored in such a small area. On the same day we can see at least three seasons, at different elevations, on the same island. Traveling along the coast, we see coral reefs, mangroves, bananas, hibiscus, orchids, camellias, bougainvillea and tropical rain forest vegetation. Stopping at a beach, we find a coconut washed up on the shore from islands farther to the south. We visit a plantation that grows guava, passion fruit, papaya, pineapple, mango and other exotic fruits. We drive as far as we can up a mountain road into an ancient cedar forest. At mid-elevations the vegetation changes gradually from bamboo, giant ferns and deciduous trees to conifers. Big firs and sugi; the Japanese cedar, cryptomeria japonica. According to my guide book, the highest elevations promise jagged snow-capped peaks and alpine fields, with spreads of rhododendron, azalea and alpine flowers in season. At close to two thousand meters in elevation, these mountains are the highest in southern Japan. Snow still falls in March and April on the peaks, while tropical flowers bloom and fruits ripen at their feet. I imagine these sights, but wonder if I may be able to get into the mountains on this trip. From the car we watch families of wrinkled, red-faced monkeys waiting along the road for handouts, like the old bears of Yellowstone. We catch sight of a rare yatsugashira; or hoopoe bird, with its impressive spiked crest, pinkish-brown plumage, and black and white barred wings and tail. Seeing the forest mostly from the car, I’m eager to do some walking. I have been given an introduction to a local poet. I have just read one of his poems in praise of the seven thousand year-old sugi on this island, the tree he calls the sacred old timer. Perhaps talking with the poet may be a good way to enter into the spirit of this place. I feel some apprehension about calling him unexpectedly. Nonetheless, I make the arrangements by phone to visit at his mountainside home the next day, inviting Koizumi-san too, who shares similar interests. Winding our way through the rain, up a mountain road suitable for a poet, we arrive at the home of Yamao Sansei. He invites us into his open-aired workshed-study, where we seat ourselves on cushions on the tatami, about an open-pit fireplace in the center—the irori. Feeling our way toward conversation, we feed the fire slowly from time to time, flooding our eyes with good sugi smoke. I ask some tentative questions at first—I’m not quite sure what I really want to ask. I’m not comfortable in assuming the role of the interviewer. Why am I here? I wonder. I am here on this island to see the trees, nature, perhaps to regain my balance after the pressures of the city; vague things like this. Why am I here in this hut, visiting this man, this poet? He looks thoughtful and well-grown into the island. But how would I ask him any of the deeper questions I might want to understand? I have read that he left the city life to come here. Perhaps we share a similar need. Secretly, I suppose I want to find out how it’s done, receive some inspiration, see some model. But how can one ask these things? Each life-path is different. He hints that his story in coming to live on this island has been a long one. I realize that the fundamental path-making decisions of a life have to be made individually. Still, there is a place and a need for inspiration and learning from others. Now I just want to watch and listen. Our conversation simmers for a while and then trails into a comfortable near-silence. I watch the drizzle outside the door-less study shed. Bright deep pink peach blossoms swing in the yard, electric-green shoots of new leaves wave gently behind. Gradually, the tighter feeling I had of this being an interview something conducted at my responsibility fades amidst the smoke that periodically floods my eyes. We sip green tea and eat slices of local oranges. Kids on school camping trips these days are told to bring swimming goggles, my school teacher friend says. You know why? It’s not for swimming. It’s to keep the campfire smoke from getting in their eyes. School rules. Thats modern survival camping. We laugh. The mood has become more relaxed. Quiet again. Just the faint patter of light rain outside, and a few large drops coming through a hole in the ceiling. “With an irori, it’s not necessary to say anything,” my host—no longer my interviewee—says. I agree. We talk of hopes for the island, now that it has become a World Heritage site. Perhaps, hopefully, it may make its mark as an “educational” island, rather than as one for luxury tourism or industry. How to manage the inevitable and growing pressures from tourism and development? How to keep the clean waters clean, and clean up the dirty waters? There are no answers to our questions and musings, just hopefulness. Why have I called on Yamao-san, the poet? It is something like the reason why I will try to call on the trees. Sometimes I need to see living examples. Reading about them is not enough. Let the tree be partly symbol. Let the man too. But beyond the symbols, and amidst them, are the real things—and contact. Somehow three hours have passed and it is growing dark. Time to head back to our lodge for dinner. Beyond my expectations, we find a feast waiting for us, replete with local Pacific “lobster” (clawless), sashimi, shellfish, vegetables, and copious amounts of local shochu. We expound on the fate of the world; on our hopes for the coming generation to hold off on growth and to preserve nature; on our personal plans. Suddenly changing the subject, Koizumi-san asks, “Do you do meditation?” Surprised, I realize the source of his question. He must have seen me sitting there in the airport. Simply, privately, I had thought. Yet he has gauged my thoughts. What I had thought private has become public. Does it matter? We talk and drink on into the night, finally retiring to our rooms. I fall asleep with the sound of waves crashing and washing away, only forty meters from my window. Morning, and rain again. Hard, heavy rain. I had hoped to climb the mountain today. Sheets of pearly rain scatter over the distant steel-gray and muted-indigo ocean, like a day-time aurora. Koizumi-san has to return to the city; I make a reservation at a I, a cheaper family inn. He drives me there and we part in a downpour. Still morning. I settle into the warmth inside the inn with a cup of green tea. I read, and intermittently watch and listen to the storm outside. Sleepy. Then, a telephone call—for me. Here? Koizumi-san reports that plane flights have been canceled due to the storm. Perhaps I’ll have company again. Since I cannot climb up the mountain, I decide to go down to the sea. I grab my umbrella and my rain gear, and head out to face the tempest. The deluge. No match for the umbrella, it’s up to my old leak-at-the-seams rain gear. Fortunately, the rain is warm. The ocean too. Locals say it’s still cold, but it’s as warm as New England’s ocean ever gets. I walk out on what looks like an immense slag heap stretching out a hundred meters along the sea. Brownish green, crenulated, like hardened lava or Swiss-cheese concrete, filled with millions of encrusted shells. It’s a form of coral reef. Not as pink and white as I had imagined, but no less a wonder. I hop along this weird, jagged, prickly windblown landscape as if exploring a new planet. Beyond are the storm-crested breakers. The sea I saw this morning, indigo in color far offshore, here close up is light turquoise, azure, and aquamarine. It is illuminated as if from a light within; defying even the darkness of the storm. I play childhood adventures; daring to see how close I can get to the edges of the waves. Now and then I touch their advancing foam-lines, but keep an eye out for the dangerous tricks I know the tide could easily play; leaving me stranded while I gaze seaward, entranced . I could survive the temperature of a dunking now, but a battering on the reef would be unwelcome. Progressively, I get wetter and wetter. For an hour or two, my gaiter-covered hiking boots stay dry. But after that—Gore-tex is overrated—I am soaked to the core. Yet lulled and rooted. And warm. The adrenaline of the city has been washed away, replaced by a new rippling of energy vibrating along my cranium. Down the spine. In my wet toes. Thoroughly drenched, I return to the inn. A bath. A beer. Dry clothes. A meal. What could be better? Another phone call. Koizumi again. Flights have resumed. “See you in the city.” The weather is turning. The minshuku-keeper tells me that the next day is predicted to be clear—probably the only chance in a long time for good weather. What is “good” weather? Was today’s “bad”? I wonder. I call the taxi company and arrange to be driven to the trail head early tomorrow morning. The trail begins unromantically at a dam site. The ubiquitous dam. O bold symbol of power, of pride, of progress! Hail to the old performance principle! I am no fan of dams, but this island has so many rivers that it can probably afford one for a dam, to provide electricity for the islanders. It’s probably better than using oil, or coal, or the supposedly friendly plutonium atom. For this small island, a dam may be appropriate. And your mind upon the rail . . . .
Amen. The trail starts by crossing a trestle over the river, passing through a tunnel, and then rounding a curve. I walk the railroad. In its tiny gauge, it seems almost like a toy. An abandoned rusting engine along the way looks only slightly bigger than those at kiddy amusement parks. Yet there is ample evidence that, in its time, it has been adequate to carry away mountainsides of multi-thousand year-old giants. The area I’m heading into is referred to on my map as “virgin” forest, though it is obvious that it is in a state far from untouched virginity. A partial virgin then. But thanks to the more primitive, pre-total-clear-cut techniques of the time when it was logged, some of the giants remain. And plenty of downed trunks are left dripping in moss, sponging up moisture. Providing rain-forest dampness. Trees re-establish quickly here. The forest heals. I remind myself that I am here to breathe in the spirit of this forest as a whole. I want to take it all in without being selective. Yet I also have goals. Today my goal is the celebrated “I”; the venerable one, reputed to be as old as 7,000 years—though I hear some doubters put its age at only half that. I won’t join the argument. To settle it scientifically would require cutting the tree down. A corpse; an arboreal autopsy. I realize that any one of these giants is sufficient; such that I could say “I’ve arrived” at any step. Yet I push on. The Japanese cedar, the sugi, appears similar to its redwood and sequoia relatives on the other coast of the Pacific. 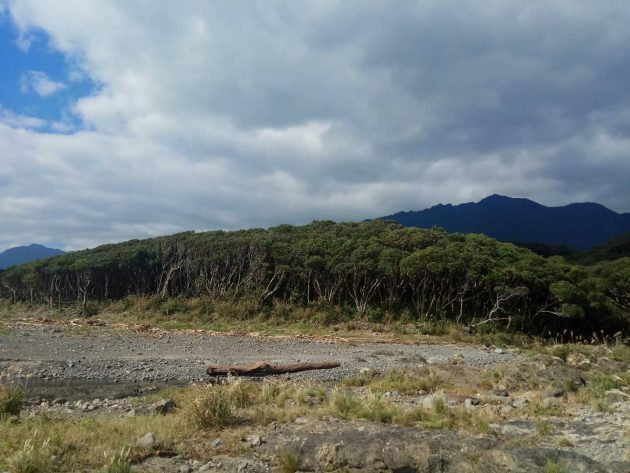 Its wood is somewhat reddish in color, and judging from the samples I’ve seen of the big Yakushima sugi , the wood appears even redder here on this island than elsewhere in Japan. The “Jomon sugi” takes its name from the Jomon era, which stands at the early edge of Japanese history. In the mountains about this ancient one there are also many other trees over 1,000 years old. I don’t know the precise history of the logging operations here, but it is obvious that it wasn’t done with the all-out clear-cut efficiency of today. I doubt it was a particular exercise of respect that saved those which were spared. More likely it was a combination of the difficulty of access, and the fact that they were less marketable. I can imagine that some magnificent, tall, straight, solid giants were the first to fall in the mid-1600’s when the first logging was carried out here. The ancient trees which remain today are primarily gnarled, asymmetrical, partly rotting survivors. Because these old ones had rotted and revived around their own bodies, they were judged as having no commercial value, and thus were spared. Many of them look like they contain as much dead wood as living. They appear to flow with dripping, lava-like, icicle-like living columns of trunks and roots; embedded amidst their decaying selves; resurrecting on themselves—or, some might say, cannibalizing themselves. In many of them, other species of trees are growing from and coexisting amongst the decaying parts. Here and there I see great four- and five-yard diameter trunks that have been chopped off at heights of ten to fifteen feet and now stand like the dark, moss-covered bulwarks of beached ships. New trees have sprung up from these stumps, some already standing 120 feet tall. As their old supporting predecessors have rotted away, some now stand high on stilts, that allow one to walk or crawl under them. The rails are resting and rusting. Theoretically they have been retired forever, now that the area has been designated as a World Heritage natural site. From now on, the forest will have to deal with a different invasion—that of humans. Hark! the pilgrims: hikers, campers, nature-lovers, and tourists! Already the roads are being “improved,” being hard-topped, the area being made “accessible.” “Amenities” are being provided. Prosperity. Already buses are hauling in tour groups to make the long day-hike to the Jomon sugi. Though it is still off-season now, I pass several groups of thirty or so along my way. How well will the area stand up to all this love and attention? We have ways of loving places to death. The cab driver who brought me to the trail spoke of the crowds; “We welcome the individuals and small groups of trekkers, but we don’t welcome these big groups.” Although I sympathize, somehow I doubt that he expresses the will of the entire “we” of the island. Ask the tour operators. Ask the construction bosses. The paradox of the tour groups here, as anywhere, is that without getting people in to appreciate, love, and stand up for these places, they will be taken over by commercial interests. Yet too many appreciators may also damage them. I realize that I too am one of these appreciators—tourists, even. I will risk the later fate for the forest and enter it. But I request its keepers; please, hold the roads. To save these wild places from over-development, access should require some time and leg work. In democracies, the will of the majority may rule. Buses and roads may have their constituency. But who is to represent the voices of the forest in the balloting? 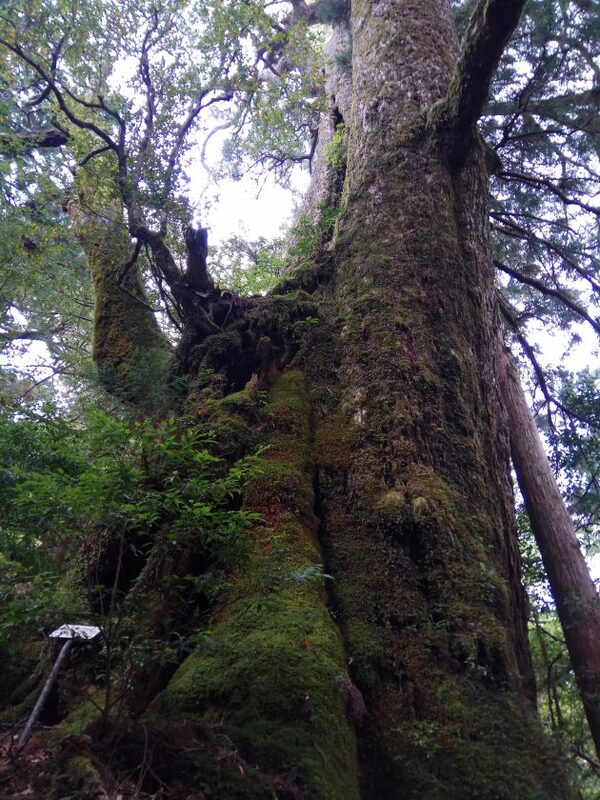 After these trees reach the age of 3,000 years or so, the Yakushima sugi are called yaku sugi. Younger than this, they are referred to as ko-sugi, or “little cedars.” There is still a healthy population of the big yaku sugi, visible all along the trail. About four hours in, I arrive at the colossal eight meter-wide “Wilson Stump,” named for an American botanical explorer. Wilson predicted that this area would one day become famous for its great trees. May it now survive its growing rush of fame. Yakushima makes me think of America’s Yosemite; an area with which it will likely share similar pressures as its fame grows. Through a ten-foot opening in the roots of the Wilson Stump, I enter a vast chamber within its hollowed trunk. Hallowed. On the far wall is a small Shinto shine; its mirror raised to the kami, the gods, reflecting a pale light from the opening above. To the right a spring bubbles, giving birth to a stream. Once it fed this giant; now it feeds what has become a quiet, moss-lined temple. The room contained by the walls of the tree trunk is large enough to hold fifty standing people. Silence—but for the bubbling of the stream, and the low sigh of swaying branches beyond. With ample stops along the way, my hike up to the Jomon sugi takes about five hours. As I climb the last mile I feel a gradual crescendo building in the energy of the forest. Perhaps this comes partly from subtle mental cues, but there is also a definable physical presence of greater density about the forest; in the air, moss and concentration of great trees. Venerable trees like this can’t live alone, however independent they may seem. They need this community. The great tree stands at about 1,300 meters in elevation. The approach is from a steep slope below. First, I catch just a glimpse of its massive trunk and its crown, comprised of a forest of great branches; each one a meter or so wide; each a tree in its own right. I drink a sip from the stream that flows from near the base of the tree. A tribute. I feel vibrations in my body. Human voices sound above me, hushed. The Jomon sugi has lately been given a respite from over-zealous admirers walking on its roots , pulling off slabs of bark as souvenirs, and eroding the soil from its base. Now it is protected by a natural wood viewing platform, set back about 20 meters from the tree. Given the growing crowds, this is needed. And to adequately take in the scale of such a tree, the distance it provides is appropriate. Its structure reminds me of the dark tracery supporting the graceful Kiyomizu temple on its steep Kyoto mountainside. I don’t need to touch this tree to feel its life. A palpable sacredness fills the space around it. Seven thousand years of life. Perhaps this being was here before the island was inhabited by humans. Until its recent discovery—for ninety-nine percent of its life—it remained unseen by them. What ages have passed in such a life? Typhoons, earthquakes, and volcanic eruptions. Comets, climatic changes, fluctuations of ozone and oxygen. Buddha, Christ and Mohammed. Loggers, and now tourists. Peace and war about the world. Yet this life force has remained; now possibly to serve as a symbol of hope for humans, in the midst of our turmoil and need. Since Yakushima is surrounded throughout most of the year in mists and rain, the burst of afternoon sunlight that now floods these trees and the deep blue sky beyond are unexpected and special gifts. Natural back-lighting accentuates the Jomon sugi’s silhouette, casting a radiance about its upper leaves and branches. For four days I waited for this. I hike up to a mountain hut only ten minutes away, to spend the night. Since it has been so clear this afternoon, I have been hoping I might be able to see the stars tonight; to see them once again in a totally black sky. What’s more, I have heard that tonight will be near the peak period for viewing a recently discovered comet. I eat dinner, watching the setting sun light up the mountainsides with saffrons, golds and crimsons, and then distant snow-streaked peaks with radiant alpenglow. As I watch, a delicate haze rises, gradually veiling the early stars. It will probably be difficult to see stars or the comet tonight. Tired with the fullness of the day, I fall asleep early, but get up in the middle of the night to check again. Clouds building up. Tomorrow will be overcast. I would like to have seen the comet, but the Jomon sugi and the forest are enough for one day. In the morning the forest appears in its more characteristic mist-soaked garb. I retrace my way to the Jomon sugi. Arriving at 6 am, I am alone with it for more than 30 minutes. Alone with a 7,000 year old being at dawn. If I were to offer a prayer—what kind might it be? For whom or for what? Would it be for the tree’s continuing long life? Would it be for me to be able to learn from it? Leaving, I descend the trail. Yesterday’s trees, now seen from the opposite direction and in the mist, appear as different beings entirely. In my awe of the giant sugi yesterday I had given less attention to the wide range of other trees. Besides its great conifers, the forest abounds in a range of deciduous and non-conifer evergreen trees. About twenty minutes down from the Jomon sugi I stop for a breather. To my surprise, I find a phallic tree-erection standing in front of me. A big tree’s smooth-skinned upper torso bulges into rounded hips and buttocks. In front, a perfect phallic shape arches and rises three feet upward, its likeness extending to a vein-like ridge on the underside of the shaft, a bulbous, heart-shaped head, and a scrotal-shaped sac below. Hard to believe, yet here it is. I have sometimes seen vaginal-shaped openings in trees. But never such a male form as this. Fecundity and the sexual abound in this forest. Without them, how could such an abundance of life be possible? Why should I be surprised at what I find? I see so little of the sexual lives of trees, and can comprehend even less. A great vibrant forest like this must be heaving continuously with sexuality manifest and felt. Masculine erection figures and feminine forms are natural; even if they may reflect in part the symbolic filterings of the mind. Any symbolism we find is, ultimately, our own doing. It is also the gradual making and re-making of our selves. To miss this is to miss the life of the forest, and the life within our selves. In the winds in the trees I hear the groaning of trunks and swaying of branches. I feel the living pulse of the forest. The rhythm and flow of the springy floor beneath my feet. The breath of the mist-filled air. The smell of inhalation, exhalation, respiration. All is fertile. All is possible. As I descend, the air heats and steams. Mist changes to light rain. Giant fern-trees appear, as if from prehistoric jungles. A family of deer waits unafraid as I watch them and they me. Near the coast, I finally reach the road. Soaked again. I hitch a ride to town, shed my wet clothes, sink into the luxury of a hot bath. Just in time for dinner, and a cold beer. I will sleep well tonight. Rather than fly, I take the slow route home. The ferry, and then a train. I slip into the feeling of my trip drawing to a close. It’s a hard transition. The train is spanking new and attractively appointed, and for some reason the staff is better-looking and more helpful than I have seen on other trains. Today’s crew tops airline flight attendants. The woman who brings me my sandwich and coffee is particularly attractive and friendly. A couple hours later I wander back to where she is tending the bar. Whisky on the rocks. Easy talk. General topics. I compliment her on the service. No flattery, I mean it. I tell her about the island. A dapper, good-looking young man works his way down the bar to join us. The island conversation gives him his opening. “So you visited Yakushima. How did you like it?” I continue to recount my impressions and praises. He assumes a professional proprietary interest in my responses and announces ceremoniously that he is with the Forestry Agency and that his region includes Yakushima. 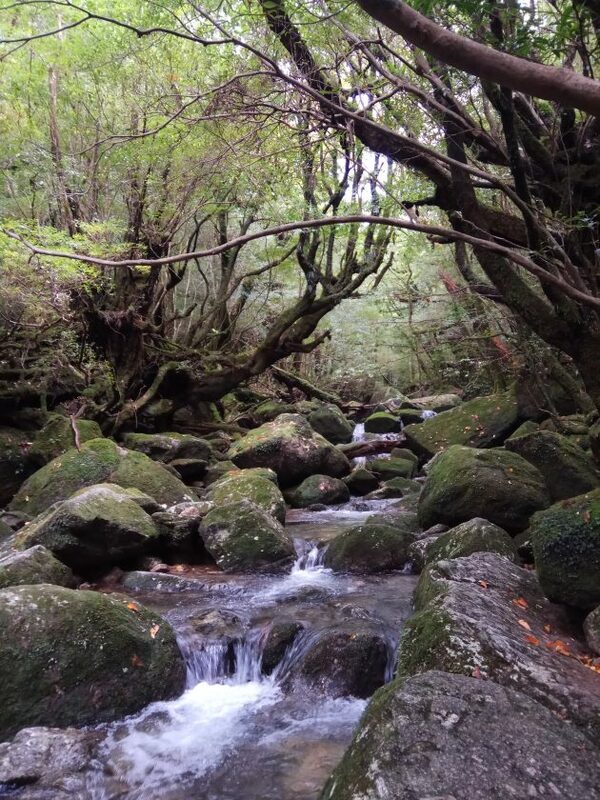 “I am so grateful that you have visited our Yakushima. I’ll have to get there myself one day. Unfortunately, I’m too busy now.” Though his manner is deferential, I suspect something more. His underlying design becomes quickly apparent as he draws the young lady increasingly into his conversation. Partly intrigued by the game, despite my annoyance at his transparent maneuvering, we continue to talk. With his fashionable suit, delicately tooled shoes, after-shave scent, and readily-apparent lack of experience in the forest, I wonder what kind of representative this man will make of places like Yakushima. I mention that I have recently been to the Shirakami mountains, Japan’s other World Heritage forest region, located in Aomori and Akita Prefectures in the north. I would like to hear his comparisons of the development of the two areas, from a forester’ point of view. But, he is sorry, he has never heard of Shirakami. I mention my hopes that now that Yakushima has become famous the government will be able to keep down the development and, especially, to resist building new roads. A slight raw nerve is betrayed. I see facial muscles tighten as he rises to the challenge and struggles for a diplomatic handling of my comment. He reminds me of how we need to be concerned with the jobs and welfare of the local townspeople. He tells me, “What is remarkable about Japan and Yakushima is the way that people have lived together with nature and used it.” Yes indeed. He drops the topic. And gradually he drops me, as his talk becomes more exclusively directed at the lady. All the while he has been keeping a small box of expensive chocolates surreptitiously placed on the bar. I hadn’t noticed it until now. With studied finesse he pushes the box in front of the lady and in most graciously flattering terms offers it as a present. She refuses several times, but the force of his demands are much too strong to resist. She blushes, and accepts. Touche! Moving into command position, he proceeds to weave the story of his business—his extreme busy-ness—with obvious pride. He is so busy that he never gets free weekends—though it appears evident that he might be able to find some exceptional time for her. He is a manager. He doesn’t get out into the forests often. He works the offices. He hopes he’ll see the Jomon sugi someday, but for now is too busy. He looks like he’d be afraid of getting dirt on his shoes if he were to hike in there. Yet he represents the long arm of the government in managing and protecting the forests. I take out the topographical map of Yakushima I’ve had with me. How much of the island is fully protected? The boundary lines indicate about as gerrymandered a pattern of land allotment as I’ve ever seen. Thin strands of protected zones skirt the mountain tops, with a few wider core areas. But the greater part of the island appears to be under Forestry Agency control; and thus will remain open for “rational” lumbering and road building. With gatekeepers like this gentleman in charge, I wonder about the future management of the forest. I have read recently of how the Forestry Agency has been losing money and is being forced to sell off land just to meet its interest payments. What now? I consider having another drink, but it’s getting near my stop. Catching myself in mid-thought, I can’t help but notice an additional aspect to this little drama in which I too have been playing a part. I feel a certain need to protect this young lady in her vulnerability. Doesn’t she see through his maneuvering? Will the chocolate do the trick? Or is she holding her own, keeping her smile up but with teeth clenched, until she can discuss her disgust for him with her friends after work? I grind my teeth, crush a few ice cubes, and drain the dregs of my drink. With this kind of governmental representative working for the forest, what can we expect? When he does eventually get to Yakushima, I can imagine the sort of capacity in which it will likely be. I can just see him drinking late into the night with bureaucrats and lumber representatives, making diplomatic speeches to townspeople and even conservationists when necessary, meticulously observing the required pieties of his calling. But then—am I inventing too much of my own drama here, and creating the demon’s role for him? Do I protest too much, indulging in the fantasy of playing the savior, overlooking my own part in the play? Is this but a jealous trick of middle age? A fine balance of objectivity, a fine equanimity I have achieved on my trip. I decide against the extra drink. My station is coming. I don’t want to rush. Especially not on this trip.